Combine chicken breasts, peppers, salsa and more for an easy chicken fajita dinner. 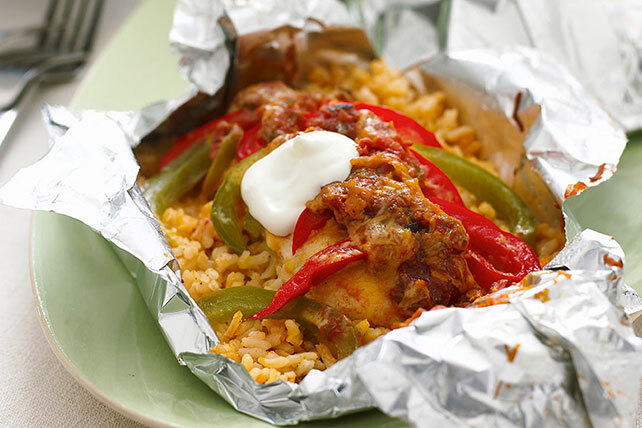 This Foil-Pack Chicken Fajita Dinner is easy on the cleanup crew. Fold up all sides of each of 4 large sheets heavy-duty foil to form 1-inch rim; spray with cooking spray. Combine rice, hot water and taco seasoning mix; spoon evenly onto foil. Top with remaining ingredients. Bring up foil sides; fold to make 4 packets. Place on rimmed baking sheet. Bake 30 to 35 min. or until chicken is done (165ºF). Cool 5 min. Cut slits in foil to release steam before carefully opening packets. Prepare these foil packets in the morning, then refrigerate until ready to bake as directed. No heavy-duty foil on hand? Just use double-layer sheets of regular foil instead. Top each opened packet with 1 Tbsp. BREAKSTONE'S or KNUDSEN Sour Cream just before serving.